I was talking to someone recently and mentioned that I see a counsellor and they responded with ” I would too if I was blind”. I was surprised by this answer. Then the more I thought about it, I am sure that there are many many people out there who assume that I would need to see a counsellor because of living with blindness or any disability. I talked with my husband after and kind of laughed a little because to be completely honest I do NOT see a counsellor because I am blind and or have a disability. 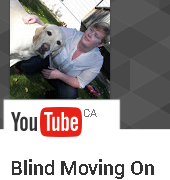 I do NOT talk to my counsellor about being blind. I know that some people can not fathom that that would not be my biggest problem. For me my blindness is not an issue, I am happy with my life as a blind person. I am comfortable with my blindness and since I do not let my blindness determine how I live my life it really doesn’t cause me any problems. I have issues with other people misperceptions of blindness and my abilities but I have lived with that my whole life and enjoy proving people wrong. I am so much more than a blind person and I have lived a lot in my life and see a counsellor because I am a mother to 3 children. My 13-year-old daughter also has ADHD. Being a parent can be a challenge especially to teenagers and when you have a child with ADHD it can really make things difficult. I also lost my father to cancer almost 5 years ago, I was very close with my dad in the years before he passed but we also had many issues that we never got a chance to deal with. There are so many other things in my life that I have had to work through. And even though I am blind, that is not one of those things. If I could give any advice on this topic, it would be; don’t assume that someone’s disability is their biggest struggle. The person with a disability lives their life every day just like you do and they have things happen that have absolutely nothing to do with their disability . Just because our reality is different than yours that does not mean that our disability consumes our lives to the point where we don’t live them. Thank you for reading ! Have a fabulous day !